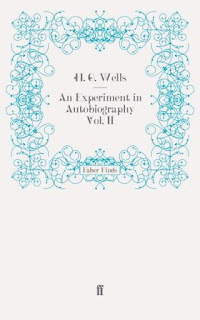 H. G. Wells’s An Experiment in Autobiography, subtitled, with typically Wellsian self-effacement, ‘Discoveries and Conclusions of a Very Ordinary Brain (Since 1866)’, first appeared in 1934, when Wells was sixty-eight years old, and is presented in Faber Finds in two volumes (also in the Faber Finds imprint is H. G. Wells in Love, which Wells drafted as ‘Postscript to an Experiment in Autobiography’ and can be read as an accompaniment to these volumes). In these volumes, Wells relates his early life, student days, struggles to make a living, ascent to literary supremacy, and later career as prophet of socialism. We follow him from the beginnings of his thoughts to his crowning conclusion ‘This particular brain … has arrived at the establishment of the Socialist World-State as its directive purpose and has made that its religion and end'. These are indeed the conclusions of an extraordinary brain and a remarkable individual.